(NaturalNews) It may not be the recommendation that is suitable to a dietician but chances are good the average person will like it: new research suggests that chocolate may act as a sort of "defense shield" against stroke. Researchers from the Karolinska Institute in Sweden followed more than 37,000 Swedish men; in the end, the data showed that those eating the most chocolate were the least likely to have a stroke, according to reports detailing the project. The results tend to support data from previous, similar studies suggesting that chocolate consumption has an overall positive effect on the body's cardiovascular system - though researchers and stroke-related organizations caution not to over-indulge in the dark, delectable delight. Researchers gathered data by tracking the eating habits of everyone who took part in the study; their overall health conditions were monitored for 10 years. The participants were split into four groups based on the amount of chocolate consumed, the BBC reported. The bottom group, on average, consumed no chocolate each week while the top group consumed about 2.2 ounces, or slightly more than the average chocolate bar, each week. In comparing the top and bottom groups, researchers found that those eating the most chocolate were 17 percent less likely to suffer a stroke during the study, the results of which were published recently in the journal Neurology. "The beneficial effect of chocolate consumption on stroke may be related to the flavonoids in chocolate," said Prof. Susanna Larsson, one of the study's authors and researchers. "Flavonoids appear to be protective against cardiovascular disease through antioxidant, anti-clotting and anti-inflammatory properties," Larsson continued. "It's also possible that flavonoids in chocolate may decrease blood concentrations of bad cholesterol and reduce blood pressure." Researchers noted that while such benefits had been linked to dark chocolate consumption in past studies, the Swedish study concentrated on consumption of milk chocolate instead. "Past research has shown that eating dark chocolate might go some way to reducing your stroke risk if it is eaten as part of a healthy, balanced diet," said Dr. Clare Walton, of Britain's Stroke Association. "This study suggests that eating a moderate amount of other types of chocolate could also be beneficial in men," she told the BBC. "However, a lot more research is needed and these results should not be used as an excuse for men to eat chocolate as an alternative to regular exercise or eating a healthy diet to reduce their risk of stroke." The study's authors warned that high sugar and fat content in chocolate should be taken into consideration. "It should be consumed in moderation," said the authors. The Swedish study is only the latest in a series of other studies purporting to show the cardiovascular-protecting nature of chocolate. Researchers at the German Institute of Human Nutrition in Nuthetal, Germany, published findings in 2010 from a study in which the chocolate consumption of 19,357 people between the ages of 35 and 65 was tracked for at least 10 years. They found that subjects who consumed the most chocolate - about 7.5 grams per day - had lower blood pressure. And lower blood pressure is known to reduce the risk of heart attack and stroke. "People who ate the most amount of chocolate were at a 39 percent lower risk than those with the lowest chocolate intakes," said Dr. Brian Buijsse, the nutritional epidemiologist who led the research. "To put it in terms of absolute risk, if people in the group eating the least amount of chocolate (of whom 219 per 10,000 had a heart attack or stroke) increased their chocolate intake by six grams a day, 85 fewer heart attacks and strokes per 10,000 people could be expected to occur over a period of about 10 years." 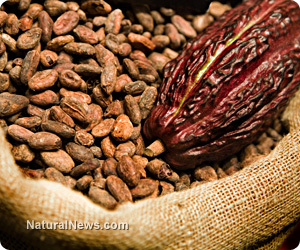 Read more about the link between chocolate consumption and better cardiovascular health at NaturalNews.com here.